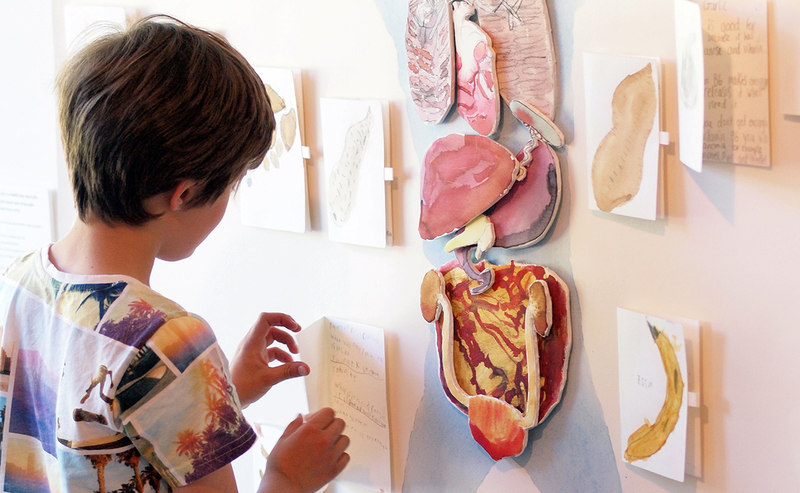 The exhibition is a celebration of the work that three Edinburgh primary schools have created over the past year with artist Natalie Taylor and graphic designer Irena Stehlikova. The featured artworks have been created using mainly plant pigment paint (e.g. coffee, beetroot, brambles and elderberries) and soil as materials. One of the exhibits, Soil is Alive, is an investigation of the underworld of soil, in which millions of living creatures recycle the surface’s organic matter. There are also a multitude of tiny booklets featured, all made by the participating children, focussing on how to grow plants, recipes for making plant pigment paint, and research drawings of insects and the interiors of pumpkins. The programme was run in partnership with North Edinburgh Arts, Craigroyston, Pirniehall and St David’s Primary Schools, and Old Kirk and Muirhouse Parish Church. 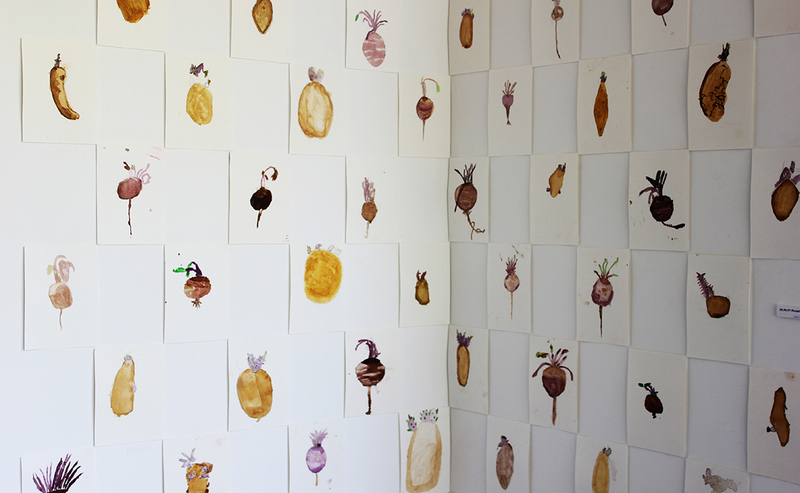 As part of the exhibition, artist Natalie Taylor devised and developed creative workshops, introducing 240 primary school-children from North Edinburgh to planting and eating edible plants through creative and hands-on activities from April 2017-April 2018. “I have found this project to be an incredibly enjoyable and inspiring experience. “The children responded really well to being able to plant and grow their own food; some trying vegetable soup for the first time, and even eating beetroot! “The combination of art, biology and gardening seemed a good mix in that the children could express themselves through painting and drawing, whilst learning facts about the fundamentals of seeds and plants. “I found that giving them high quality paints, paper and pencils made a difference, and that they were able to focus on looking at something intently, i.e. when drawing a chitted (sprouting) potato for example and the finished paintings reflect this. “When we harvested 20 kilos of potatoes or so from the Old Kirk and Muirhouse Church garden the children were very excited, and later when we brought in the local 'Mum and Dad Cooking' ( M.A.D.) group to make soup it made it easier for them to make the connection between garden and food - a rare thing these days. “In terms of the wider community engagement, we have also been running an outreach project with a youth worker with gardening skills to put all these ideas into practice in the real world, and this group now meets twice a week. It involves children and parents in hands-on, practical ways and the aspiration is to be able to enable people within the local community to grow their own food. “Statistically, in EH4 one in four people experience food poverty, so the idea is that this, in time, will eventually enable the community to provide themselves with low cost fresh food. The Centipede Project is just one of Go For It’s many funded projects, which secured funding in order to deliver creative, community-led, artist-facilitated activities - particularly aiming to reach people with mental health issues and the long term unemployed. “The support of the Go For It programme has been invaluable for the Centipede Project. It has allowed us to build up strong and long lasting relationships across the community and let us work with highly skilled people to create projects like this one. “The integrity and reach of the Germinator project is down to Natalie’s artistic vision, the commitment of everyone involved, matched by the enthusiasm of the participants. 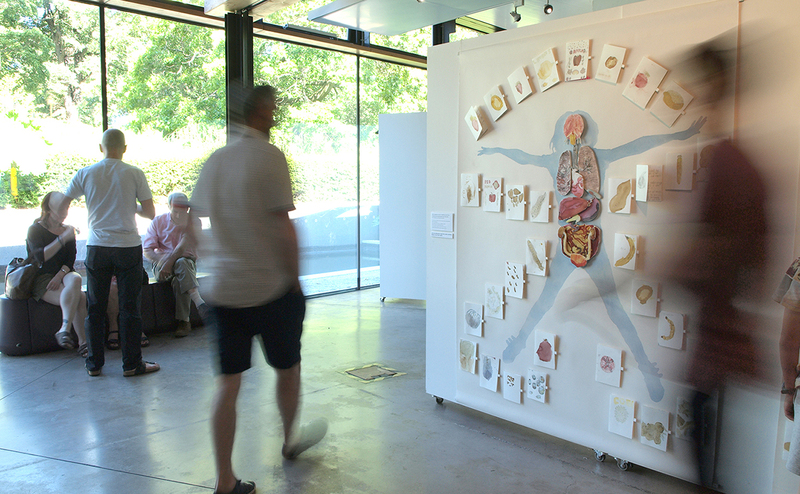 The exhibition is running until Wednesday 4 July in the John Hope Gateway within Royal Botanic Gardens Edinburgh between 10am-5:45pm each day. Entry is free with no pre-booking required. A catalogue, postcards, and tea towels featuring the children’s paintings and drawings are available by graphic Artist Irena Stehlikova. The Go For It Fund has £600,000 available for projects for the rest of the year. Any interested Church of Scotland churches and voluntary sector organisations working closely with a Church of Scotland congregation can check the application criteria here. 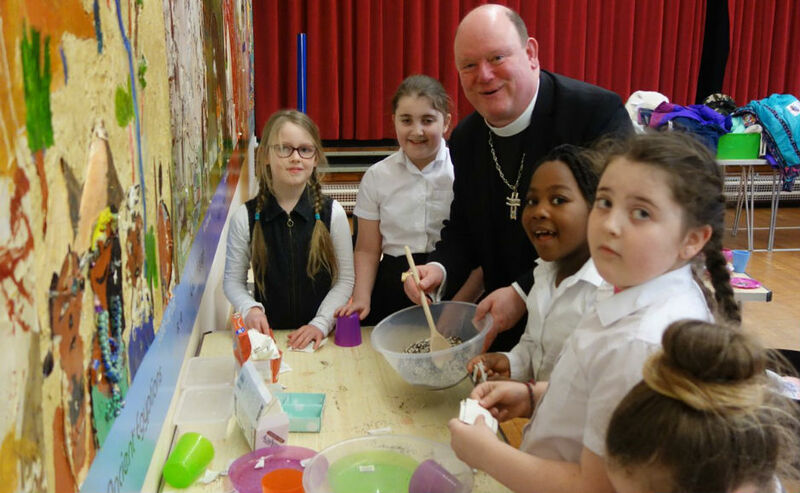 Learn more about the Church of Scotland’s work on ‘Investing in young people’.